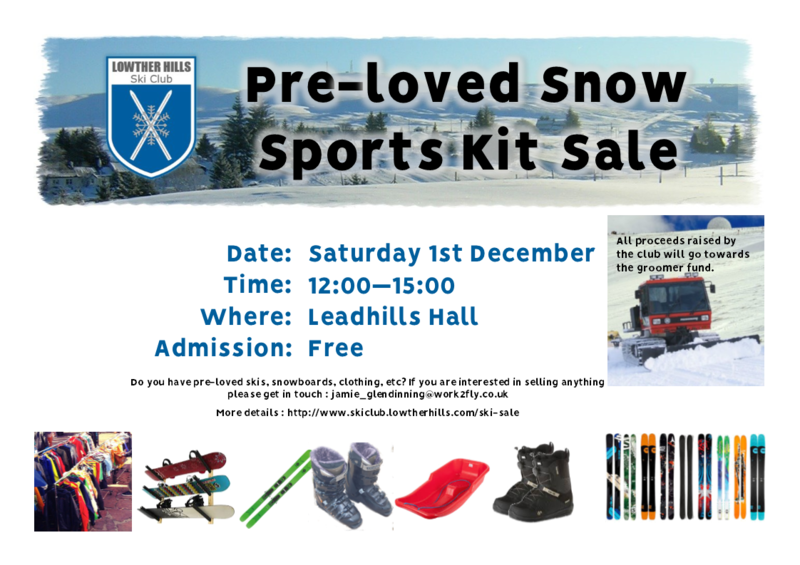 WHAT IS THE LOWTHER HILLS SNOW GEAR SALE? The sale offers snowsports fans an excellent opportunity to buy and sell second hand and new ski and snowboard equipment and clothing. Here you can find a wide range of competitively priced equipment to suit all budgets. Goods can be closely inspected and boots tried for fit with ski club members available for advice. There is an opportunity to closely inspect goods but please do not hoard items you do not intend to buy. Ski Club members will be available for advice. Payment is by cash or cheque only. If we have internet access in the hall we may be able to take paypal payments but that is subject to confirmation on the day. We don’t accept “old skinny” skis. We also won’t accept boots with obviously heavily worn toe and heel pieces nor skis/snowboards with obviously broken edges, unrepaired full thickness base damage or obviously very loose bindings. Sale volunteers will quickly check equipment at check in. Other than these restrictions you can try your hand at selling anything as long as you pick it up if it’s not sold. If you are intending to sell more than 30 items please contact Jamie, the organiser, by email (jamie_glendinning @ work2fly.co.uk), to discuss in advance, otherwise we can’t guarantee to accept all the items on the day. £2.00 to sell up to 20 items. £3 up to 40 items. Please contact us if you want to sell more than 40 items. The minimum price for goods is £5, less than this and we’ll accept the item as a donation. Goods can however be a bundle of items. ie bundle of age 8yrs thermals. Between 15:00 and 16:00 sellers can pick up their unsold items and if time allows collect their money. Payments may be made later by cheque, paypal or bank transfer. When sellers arrive after the sale they will be given a list of their sold and unsold goods. Unsold items not picked up will be disposed of by the club. Sellers can choose not to attend payout but have a cheque sent to them or a bank transfer for items sold provided they are happy to donate unsold items to the ski club. Please let us know when dropping kit off. The club accepts donations of ski or snowboard equipment or clothing. These should be handed in between 11:00 and 12:00. Donations are sold with all proceeds going to the club and if donations do not sell the club disposes of them. We reserve the right to decline donations we think are very unlikely to sell but will accept almost any equipment. Tea, Coffee and some soft drinks will be on sale. Why not extend you visit to Scotlands highest villages by visiting the following events running the same weekend as the ski gear sale. Take a trip on the Santa Express train at Leadhills and Wanlockhead Railway and visit Santa down a real Mine. Every child receives a present from Santa in the Mine. A more relaxed and original way to do your Christmas shopping with a superb collection of local crafters and artisans. Wanlockhead Community Centre. Saturday 1st and Sunday 2nd December. Come and check progress with the building works and the tree planting at Scotland's first wooded ski slope. If you are planning on selling anything at the sale can you please pass round the details to friends and family. If you are able to put up a poster promoting the event on local notice boards please do so. Contact the organiser: jamie_glendinning @ work2fly.co .uk for high res version of poster if you want to print it out at home. Please also share details on social media. The more people attend the sale the more chance we have of selling things! Please contact the organiser: jamie_glendinning @ work2fly.co .uk with any questions about the sale.